Demand for CRRCs in the region has grown. Dow Coating Materials has introduced a number of innovative technologies that have created a stir among its clients in the coatings industry, who have used them to create cool reflective roof coatings (CRRC) in the past year. In doing this, Dow has also demonstrated its commitment to innovation that supports sustainable solutions and enables a healthier building environment. The company has seen a growing number of orders for its water-based Primal EC4642 ME acrylic emulsion, a new product which is a critical component in CRRC formulations. 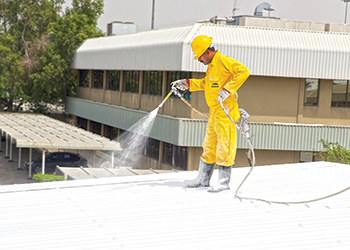 “This polymer was developed specifically for the conditions in the Middle East of extreme warm temperatures, sun and dust and is designed to cope with surface temperatures in excess of 80 deg C,” says Alessandro Moraes, business director, Dow Coating Materials IMEAT (India, Middle East and Africa). 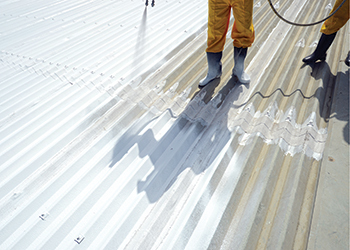 Primal EC4642 ME acrylic emulsion is the latest development from Dow Construction Chemicals, which has many years of experience in developing products for elastomeric roof coatings, including CRRCs, says Moraes. Dow has also added to its portfolio the Primal SF-208 ER binder, which is created using Dow’s Formashield technology. It was developed in response to concerns about IAQ (indoor air quality) and health effects associated with exposure to formaldehyde, says Moraes. “Formashield is designed to remove formaldehyde from ambient air in buildings, through a process which triggers a chemical reaction between formaldehyde and the binder – transforming indoor air pollutants into harmless vapours. With some countries introducing regulations to help drive indoor air quality improvements, there has been an increasing interest in Dow technology, simply because it goes beyond reducing emissions from paints and actively removes indoor pollutants emanating from other sources in homes and buildings,” he adds. “Our advancements such as the Formashield technology have been widely accepted by the construction industry and we are seeing it being employed across various regional projects,” he further says. Another successful development is the Primal AS-8012 acrylic emulsion – a tailored solution for formulating environmentally advanced and highly flexible cementitious waterproofing membranes. As leaders in their respective segments, Dow Coating Materials and Dow Construction Chemicals are supplying game-changing technologies and formulations to paint and construction chemicals manufacturers across the globe. “In the Middle East, we are making sure that our regional offering is adapted to the local paints and construction challenges (energy efficiency and climate). Our technology-based portfolios offer great value and performance – and our products have proven their superiority in many infrastructure and mega projects across the UAE and the broader Middle East,” says Moraes. Dow teamed up with formulator and applicator Henkel Polybit to create a demonstration application incorporating CRRCs on a one-storey building owned by Trakhees-EHS in the Jebel Ali Free Zone in Dubai, UAE. This building is used for training purposes and referred to as “Green Gallery”. Trakhees-EHS is the regulatory arm of the Ports, Customers and Free Zone Corporation (PCFC) in Dubai and has spent several years working to improve the sustainability of buildings, using Leed (Leadership in Energy and Environmental Design) ratings as a starting point. Moraes says the one-storey building was due for renovation, and owner Trakhees-EHS was eager to try a new CRRC developed by Henkel in partnership with Dow, for use as a pilot study. This test case has shown significant advantages and other developers are now being asked to consider applying CRRCs to buildings in the future, as Dubai intensifies its focus on energy efficiency. Dow’s integrated, market-driven, industry-leading portfolio of infrastructure, energy, water and plastics businesses delivers a broad range of technology-based products and solutions to customers in high-growth sectors such as packaging, electronics, water, coatings and agriculture. It has been present in the region for more than 50 years, delivering a broad range of innovative chemicals to local customers across many industries. Dow’s facility in Jebel Ali – one of the first investments in the Jebel Ali Free Zone – provides regional coatings and construction customers with the most advanced materials available in the industry and also houses technical application centres in paints and coatings. This means local supply of key products in the UAE versus imported ones. Moraes says the company has experienced fantastic growth over the last four years. “With manufacturing and technical experts on the ground, our regional team is poised for growth and geared up to capture the tremendous growth opportunities across the infrastructure space. With governments massively spending to create new facilities or upgrade basic infrastructure, we truly expect accelerated growth in the coming years. “And despite fiscal pressure due to low oil prices, the construction sector has every reason to remain optimistic with mega projects driving further growth. Over half of these are already in the construction phase, including a number of high-profile developments such as the 2020 Dubai Expo and 2022 World Cup in Qatar. The focus is now on sustainable and environmentally responsible projects, right across the region, Moraes says. “The UAE places sustainability at the top of its government agenda, boasting the highest share of green buildings across the Middle East and North Africa. Saudi Arabia and Qatar are working on similar plans and are definitely pushing for sustainability and energy saving projects,” he says. “The sustainability and health of our business is tied into the sustainability of the communities we operate within, and as such we are heavily invested in the development of regional communities. We will be continuing these efforts in 2016 across the various sectors we operate in,” remarks Moraes. 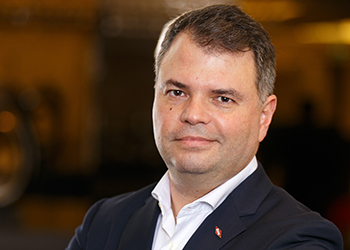 To maintain its market share, Moraes says Dow relies on its innovative portfolio to keep a competitive edge, and its local team works closely with customers and key stakeholders across the construction value chain to tailor its offering and address very specific needs. Dow supplies to 180 countries and employs approximately 53,000 people worldwide. The company’s more than 6,000 products families are manufactured at 201 sites in 35 countries across the globe. Dow’s regional headquarters for India, Middle East, Africa and Turkey is located in Dubai. The office oversees its activities in the region and most members of its leadership team are based there.